Hoed is a lightweight tracer and algorithmic debugger that is practical to use for real-world programs. To render figures in explore mode Hoed uses Graphviz, installing Graphviz is optional but recommended. To locate a defect with Hoed you annotate suspected functions and compile as usual. Then when you run your program, information about the annotated functions is collected. 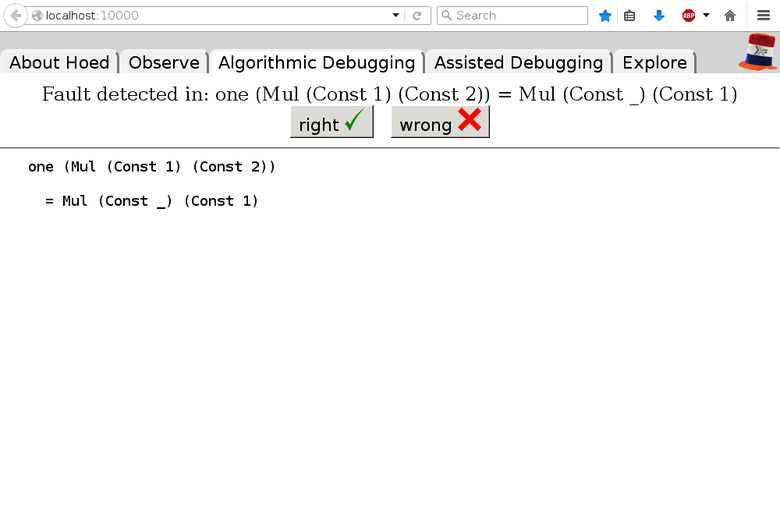 Finally you connect to a debugging session using a web browser. Let us consider the following program: a defective implementation of a parity function with a test property. Using the property-based test tool QuickCheck we find the counterexample #1 for our property. Now we use the combinator testO to trace our program for the counterexample of our property. After running the program a computation tree is constructed and displayed in a web browser. To observe a function its argument and result type need to be of typeclass Observable. Hoed comes with instances for the base types and several other commonly used types. 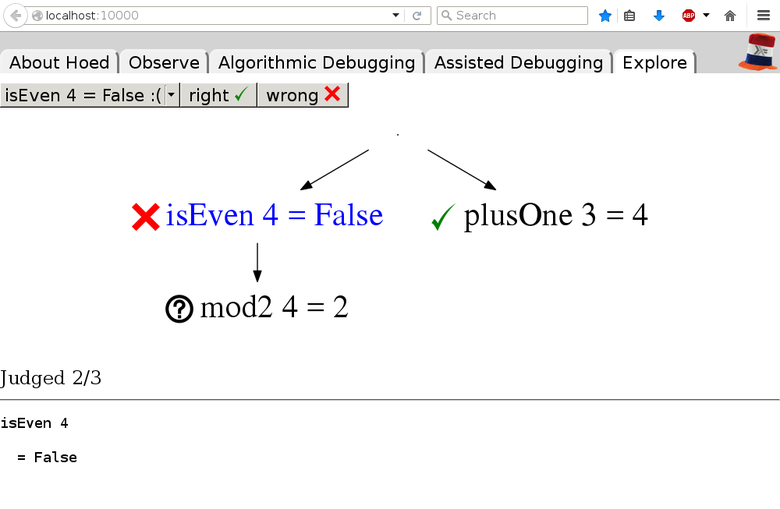 Hoed offers several views on the collected debugging information. Algorithmic Debugging: Hoed uses Hood's observe technique to record information during a program execution that shows unintended behaviour. Hoed's post-mortem algorithmic debugging view presents the user with questions about intermediate computation statements. The user has to judge whether these statements agree with their intentions. After some questions and answers, the debugger locates a defect in a slice (i.e.\ part) of the program. Explore: Hoed organizes the computation statements in a tree. In this mode the computation tree can be freely explored. 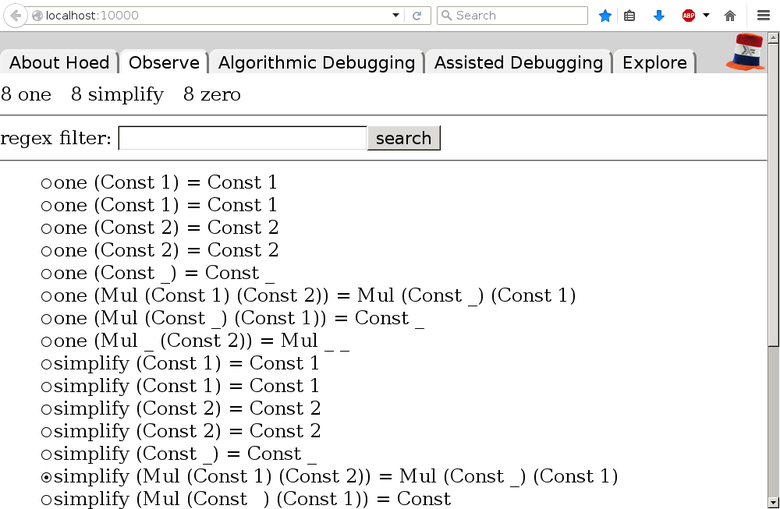 Observe: A list view of the computation statements that can be searched with a simple keyword or a regular expression. One of the computation statements can be selected and used as starting point for one of the other modes. Hat is probably the most advanced tracer tool for Haskell. It traces every reduction and provides many tools for viewing this trace. Hat requires a transformation of every module, even libraries we are not interested in. The transformation does not support as many language features as GHC and in practice many programs cannot be debugged with Hat. In contrast, Hoed is just a library and only functions we are interested in need to be annotated. Many programs that are difficult to debug with Hat can be debugged with Hoed. HOOD can be used like Debug.Trace for printf-style debugging while respecting evaluation order. Observing headDoubler in above example gives headDoubler (1:2:3:_) = 2:2:3:_. Hoed is based on HOOD, but gives a relation between computation statements and adds an algorithmic debugger. This page was last modified on 22 December 2015, at 09:12.